Of the many responsibilities that fall to the IT department, managing the enterprise printing environment scores somewhere near the very bottom on the fun-o-meter. And if we're honest, dealing with that environment from the end-user side doesn't rank very highly on employees' enjoyment scale, either. Probably for the very same reasons. Which is why, like e-mail, enterprise printing is not only vital to the basic day-to-day function of your organization, its smooth operation is absolutely crucial to keeping employees happy. In other words: Devoting inordinate amounts of time to keeping the print environment up and running is simply a headache that goes with the IT territory, right? False—or at least, it doesn’t have to be. If you were to eliminate print servers by deploying PrinterLogic’s printer management software throughout your organization, you could reduce the time you spend on managing printers by more than 50%. 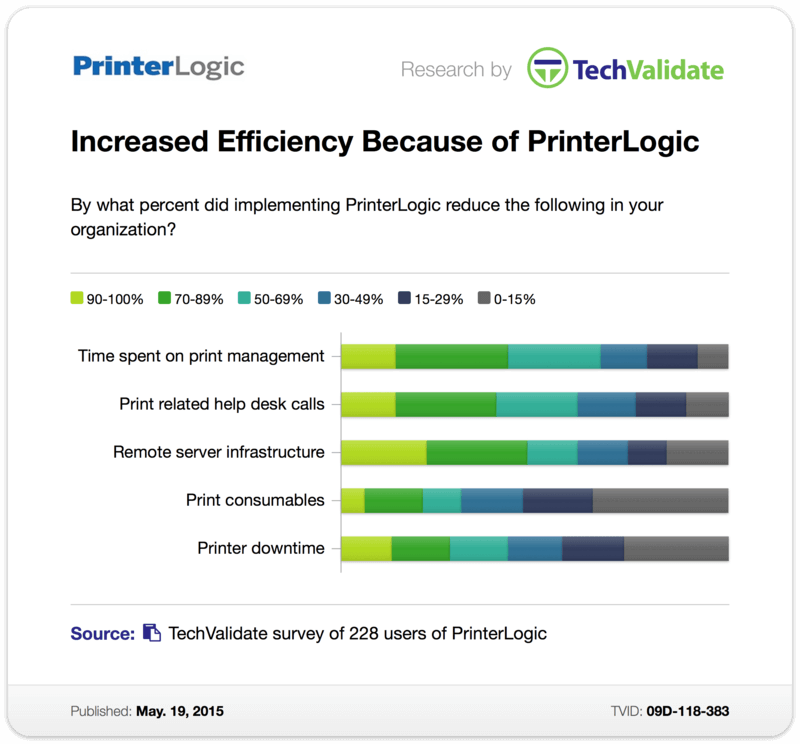 That's what data collected by a recent TechValidate survey of hundreds of PrinterLogic customers revealed for more than 68% of respondents. Even better, 44% of enterprises reported a reduction in print management time of at least 70%. How exactly does PrinterLogic let you experience the relief of eliminating print servers while drastically cutting the time that print management demands? Central management: Via a single web-based printer management interface for the whole enterprise, you can deploy printers without GPOs, scripts or print servers. You can even set default preferences with a click. It doesn't matter whether you have ten printers or ten thousand. Lighten the network load: To reduce network congestion and speed up print times, PrinterLogic cuts out the hardware middlemen, so you can print directly to printers from end-point devices enterprise-wide. Furthermore, PrinterLogic can integrate with WAN caching technologies for local driver download. That also makes printer driver management a lot easier. Remove single points of failure: In the event of a WAN outage or a host server failure, PrinterLogic enables your entire organization to continue printing without skipping a beat. So you see, enterprise print management doesn't have to be a time vortex. PrinterLogic lets you replicate all the functionality offered by traditional print servers while streamlining driver management, simplifying printer deployment, cutting service desk calls and slashing downtime. Now, what are you going to do with all that extra time on your hands?